We, at Cosmos International University under Modern Heuristic Education System, don't validate the so called "accreditation", which is so popular nowadays in some countries' education systems, which finally becomes merely a kind of politics and merchandising the word "accreditation". 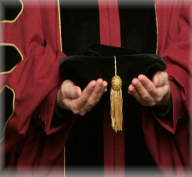 Though it is not anti-accreditation, None Accreditation Policy of Cosmos International University believes that institutional accreditation is a kind of discrimination in many ways and oppression too in some ways to qualified students who come from non accredited schools, institutes, universities or organizations, and these forces of convergence eventually result in perspicaciousness of a business dealing. Cosmos International University under none accreditation policy recognizes Modern Heuristic Education System. We affirm any education system in this cosmos, as a whole, can be in no way bait and switch of a business though we can offer such a study for students to read it up as a subject. Thus, accreditation policy in many countries has been equivocally misinterpreted as an education system whereas it is merely a pedagogical methodology and an expertise, which a genuine heuristic researcher can have them all. It's shameful that students who pay more money for their study get more salary when getting a job or employment. It's nothing to do with education but just a business dealing. If the system of education you follow really works and it suits how you exactly need to learn or study a lesson or subject you will be able to achieve the level of education you wanted in a shortest time possible with less expenses whereas, for many people who don't even know the education system they should follow to achieve that level of education may have to spend hundredfold expenses and time. Moreover, it's not the only druther to rubricate educational websites in dot edu because dot edu itself isn't education. It's a small space for written articulations on a topic, reserved by a particular group of people who have been influenced by an educational-based business, amalgamated as exactly as some companies do. The wisdom that we gain from our education, which remains in our life and is usable for profession and usable to make a living regardless of how much time and money we spent for, is called 'real education'. Real education is nothing to do with building an educational website on dot edu, dot info, dot ws or dot org. The content is more important than the extension of a web address. We know that using dot edu is simply good-looking and easily recognisable. But it's not the dot edu thing, which is 'real education'. Therefore, educational websites can also be augmented in any space whether it's in dot org, dot info, or whatever dot it may be as long as it's a place of expression where people of interested party can read and understand the message the writer wants to convey. Cosmos International University doesn't seek institutional accreditation but eagerly seeks a person's suitability for a job or joining a program of the university. 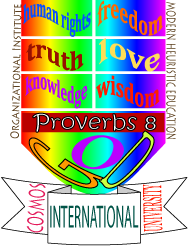 The suitability is fully based only on his or her own individual qualifications, knowledge and skills, and availability but not on his or her alma maters' accreditation because Cosmos International University practices freedom, human rights and equal opportunity for all mankinds individually regardless of a person's country of origin, gender, skin color, nationality or body structure. Researchers at Cosmos International University do not depend on institutional accreditation but they individually try to be the most suitable skilled candidate when seeking employment opportunities in modern job markets and societies world wide. We have a negative opinion on the ideology that is, "The more you pay for your studies the better salary you will earn when you get your professional job". Salary scale of a master's degree holder from Cosmos International University and a MA degree holder from other university should be the same regardless of how much a job applicant spent for his or her studies at a college or university. The applicant who posses a lower skill and achievement should be paid lesser than the one who has satisfactory skills and abilities. Because we want to get real education but counting about how much a person paid for his studies for pursuing and achieving his education level. Job giving in the area of education and teaching should not be based on how much a person spent for achieving his or her education and how he or she reaches that level and standard but the emphasis of which human resources and recruiters must concern is the qualifications, ability, skills and education level of individual job seekers. Earning the first degree after high school graduation equips us with sufficient knowledge and ability of doing self-study to educate ourselves or doing things on our own regardless of age and country of origin. We would like to point out the fact that some people from developed countries are likely to get jobs easier because of their background which is the government system in their home country. Since we can't say hundred percent of those people who grew up in such a country are more capable of doing things than people who come from other developing or underdeveloped countries, the idea of giving job or having a kind of acceptance for a job should not be based on the government system but it should depend on individual job seeker's self motivation, education level, practicality, skills, qualifications, responsibility and accountability to do the job. The first thing we should know about is nobody is superior to any one in the world whether the person is from a democracy, socialist or communist country. The only two types of learners we can find in our world today's education are faster creative learners and uncreative but imitative slower learners. We should be careful not to let the result of bullying the slower learners. What we need is to give respect to one another. Whatever we do in our education should result in helping one another or passing the knowledge to spread the best idea we have so that imitative and slower learners may also be gradually benefited. Since there are some, though not many, who are great thinkers unnoticeably and tacitly even in the country where democracy and human rights are not practiced at all, institutional accreditation isn't validated as the criteria of making judgment on a person's education level and qualification. Therefore, Cosmos International University's educational policy has a wider perspective on accreditation which is none-accreditation policy, and it is good for every individual, whose education is heuristic. Some novice politicians and unqualified recruiters and human resource managers cause to exist blacklisted education systems in their own term whereas, in reality, there is no such blacklisted education system except education systems that really work and that don't. For example, education system of some countries including degrees and diplomas issued aren't useful when seeking jobs in other countries due to lack of skills required. Otherwise, there is no blacklisted education or blacklisted teacher, and this kind of dictators and communist ideology contrasts against the policy of Cosmos International University and Modern Heuristic Education System. In case there is, it's merely a discrimination that violates real education and some particular people who are really educated. It shouldn't be existed at all in fact.